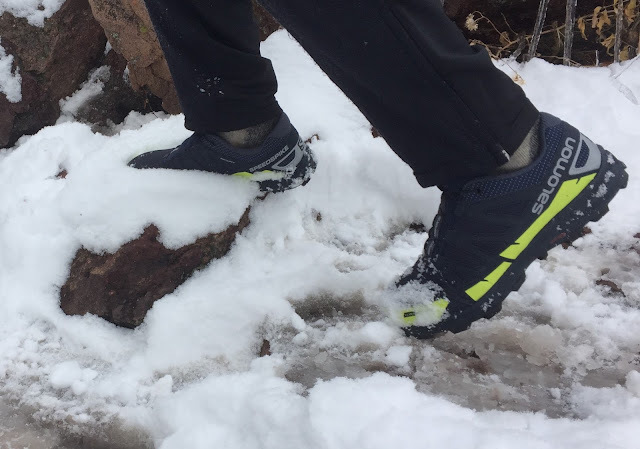 Road Trail Run: Salomon Speedspike CS Review: For gnarly snowy, icy, slippery conditions. Salomon Speedspike CS Review: For gnarly snowy, icy, slippery conditions. I run in the local mountains here above Boulder year round and look forward to the changing of the seasons. In the Winter (as well as a good chunk of Fall and Spring most years), we receive enough annual snowfall to really make a mess of the trails and with varying aspect, fluctuating temperatures and a wide range of elevations encountered on a single run, it is not uncommon to find just about any type of surface. Packed snow, fluffy snow, slush, bulletproof luge run, mud, rock, dry trail and then repeat. Supplemental traction devices, such as Microspikes (see our comprehensive traction round up here) are awesome when the trail is mostly packet snow from trailhead to summit, but those days are the exception given our weather and conditions here in Boulder. 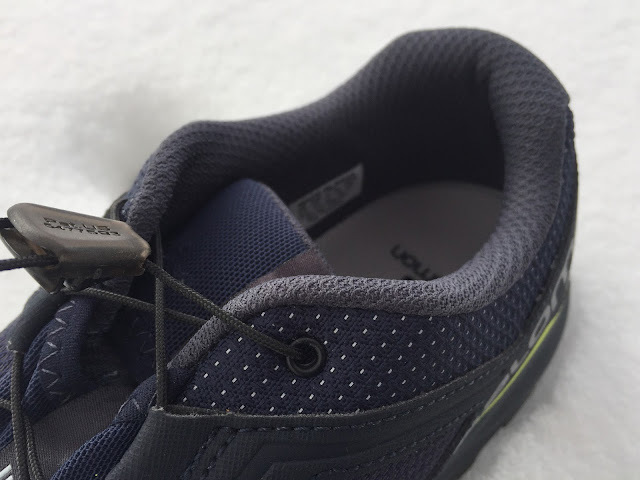 As such, I find a studded shoe to be more appropriate on the majority of Winter days when I know I will be on steep ice and snow, as they are better equipped to handle a wide variety of conditions, are lighter, more agile and stay sharp enough to bite well on ice. I have long used Ice Bugs, which are amazing studded shoes, but the fit has always been a touch off, a bit too voluminous even with a thick winter sock, resulting in a somewhat less than secure fit. Agility, weight and response can also be a bit off. La Sportiva Hobnails are a good option as well, as you can add them to almost any shoe, but at $54 for 18 hobnails (plus installation tool), I find 9 studs per shoe to be a bit skimpy. Enter the SpeedSpike CS, which pretty much addresses all of my above concerns. The upper is reminiscent of the wildly popular Speedcross, though a bit more beefed up and substantial with a more complete toe bumper and thicker materials. The added thickness is due to the Clima Salomon, a water resistant textile integrated with the anti debris mesh. Fit is true to size, with a precise and secure fit, with just a little wiggle room. My review pair is my normal size 10 and even though I normally size up by half size in a winter shoe to allow for thicker wool socks, I did not feel the need to do so with the Speedspike CS. Around the perimeter of the shoe, where the midsole meets the upper is a thicker protective Mudguard shield, which combined with the toe bumper adds another layer of water protection. 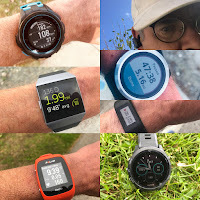 The Speedspike CS utilizes Salomon's trademark quicklaces, which work perfect, as I am able to obtain a perfect fit on the first pull with no mid run adjustments necessary. The heel collar is plushly padded and a perfect height. The heel counter is secure and protective. The Speedspike CS has a booty like Sensifit construction that provides a very secure fit. The tongue is well padded and protects well from the thin quicklaces. The midsole is injected EVA, providing a somewhat firm feel and moderate responsiveness. On the typical running surfaces where I will choose to use the Speedspike CS (snow, ice and winter conditions), it is appropriately balanced. The outsole consists of Salomon's Premium Wet Traction Contagrip rubber with a wild configuration of aggressively deep, sharp and well positioned lugs. Topping those lugs are sharp carbide studs, 15 on each shoe, which guarantee a solid bite on just about anything, especially ice. The carbide studs are very secure and I can't see them falling out, as they are deeply anchored within each lug. These studs are identical to those found in studded car tires, which take many tens of thousands of miles to show wear. I have observed no wear on my test pair and past experience with other carbide studded shoes shows that the shoe will wear out long before the studs. The Speedspike CS are amazing in snowy, icy, slippery conditions. They give confidence inspiring traction on just about anything, much because of the carbide studs, but also because of the very deep lugs and Premium Wet Traction Contagrip rubber compound. The Climashield does a fantastic job keeping my feet dry and warm for wet and slushy runs of up to a few hours. Since they do not have a built in gaiter, I will almost always use an over the ankle gaiter to keep the snow and wet out. 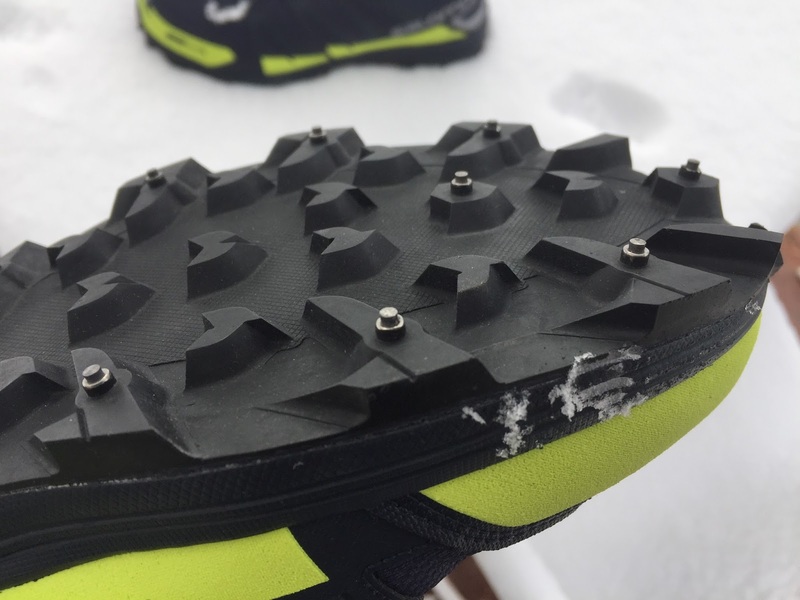 Salomon had the studded Snowcross last year with built in gaiter, yet only 9 studs. They also had the Spikecross CS without gaiter and 8 studs. Now they have the Snowcross 2 with no studs and the Speedspike CS with more studs but no gaiter. 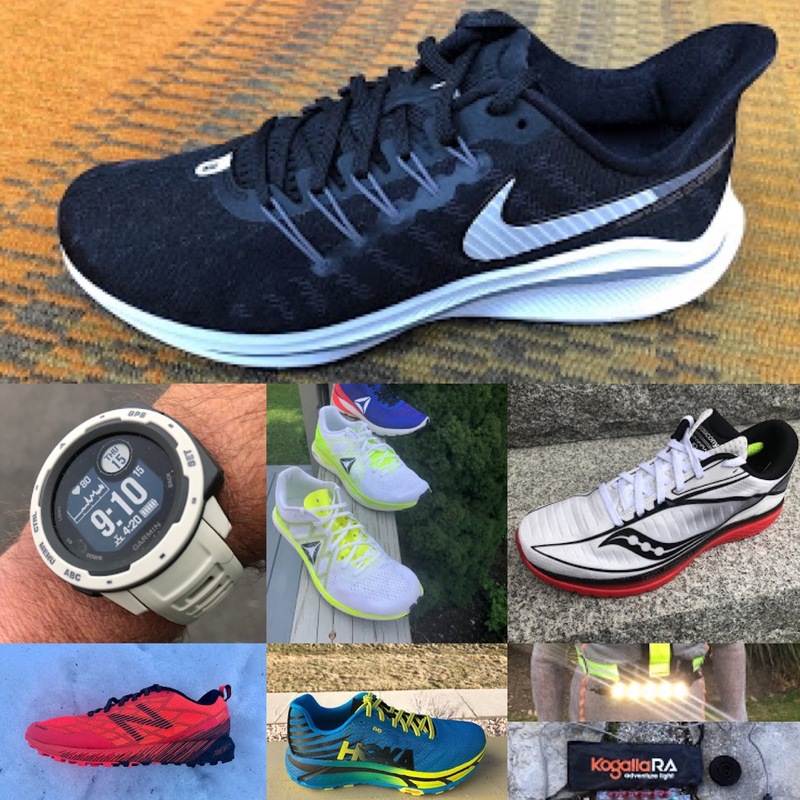 My ideal shoe would be a slightly lighter Speedspike CS with minimal gaiter, which would round out their winter shoe line very nicely. The fit and security of the Speedspike CS upper is perfect for pushing hard in varied conditions on steep gradients and sidehilling. Though not a lightweight shoe, they run lighter than their measured weight implies and I feel comfortable pushing them fast, as they are responsive and agile enough to do so. - .1 would benefit from a gaiter. 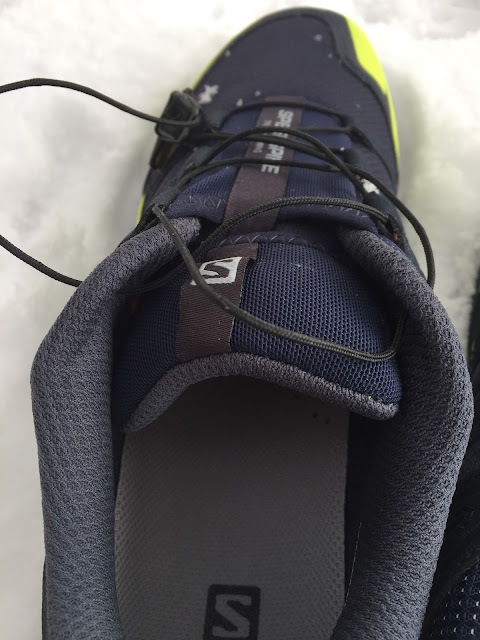 The Salomon is a bit heavier and has 4 fewer studs per shoe, but the lugs and studs are sharper, more pronounced and more effective than the Ice Bug (which I previously viewed as the pinnacle of studded shoes). Combined with the more secure and precise fitting upper, I feel much more confident pushing the limits of the Speedspike CS. The Climashield also has better water resistance, which is most evident in wet and slushy conditions. The Speedspike was provided at no cost.The opinions herein are entirely the authors'. Thanks for the review Jeff. I'm deciding which to return between these and the icebugs. I'm also based in Boulder and run the same terrain as you. The salomons do seem like they will work better in snow and ice, but I'm wondering if they will skate off rocks easier than the icebugs. Any impressions on which would work better for those conditions (like now) where there is more dry than snow/ice, but you still need traction? You honestly could not go wrong either way, both are great shoes. The Speedspike has a few less spikes, but I like that they are a little bit more pronounced than the Icebugs. 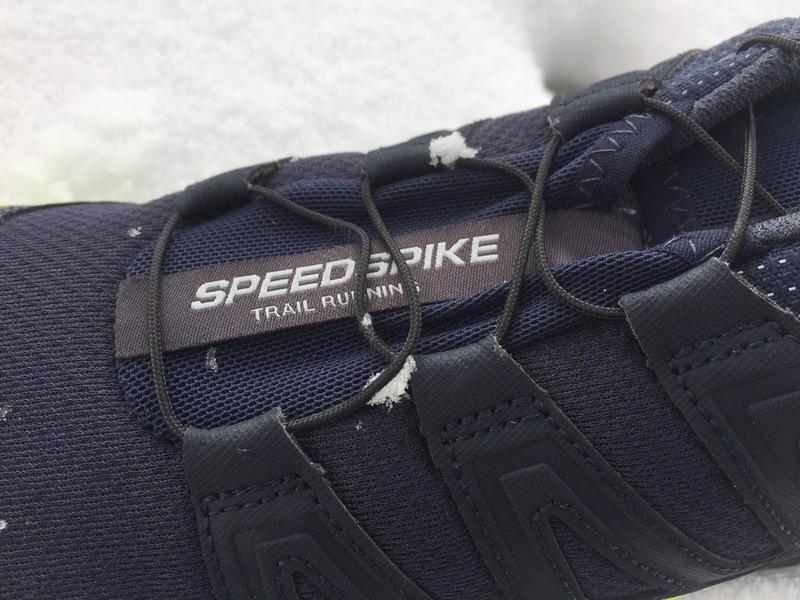 I also think the Speedspike has a much more secure and confidence inspiring fit than any of the Icebugs I have owned which is important to me when maneuvering in tricky terrain (snow/ice, technical stuff), especially when moving fast. As far as dry rock performance, it all annoys me a bit no matter what hearing metal on rock, be it Speedspikes, Icebugs, screw shoes or whatever. I would call dry performance between the two a tie. Thanks for the input. Both shoes feel pretty good on my feet, but I'm thinking I"ll go with the salomons since the platform feels a little lower, smoother and more stable. I also like that the salomon upper feels significantly more breathable than the icebugs, something that I think actually improves warmth (dryness) in most CO winter conditions. Cheers, I appreciate your reviews. The salomon xa alpines have served me well in their natural habitat.